Rinse quinoa in strainer; drain well; and place in heavy, medium saucepan. Cook over medium-high heat, stirring constantly with wooden spatula until grains stick to bottom of pot and then start to move freely and smell toasty, about 5 minutes. When grains of quinoa start to pop, move pot from heat and pour in 1 3/4 cups water, standing back as it will splatter. Immediately return pot to heat and reduce heat to medium. Add 1/4 teaspoon salt, cover, and simmer for 15 minutes or until quinoa is almost tender. Off heat, let grain sit covered for 10 minutes. Using fork, fluff quinoa and transfer it to mixing bowl. There will be about 2 1/4 cups cooked quinoa. Let quinoa sit until it is room temperature. 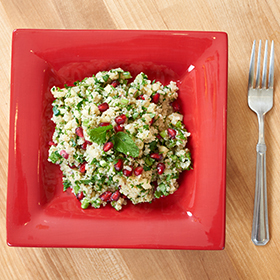 Add apple, pomegranate seeds, cilantro, mint, parsley and scallions to grain, and, using a fork, mix to combine. In small bowl, whisk orange juice or two citrus juices with remaining 1/2 teaspoon salt until it dissolves. Add 4 to 5 grinds pepper; then whisk in oil. Pour dressing over salad, and toss with fork to distribute evenly. Serve within 2 hours. The quinoa and dressing parts of this salad can be made up to 8 hours ahead and then covered and refrigerated separately and combined shortly before serving. Serving size: 1/4 of recipe. Amount per serving: 179 calories, 4g total fat (less than 1g saturated fat), 32g carbohydrates, 5g protein, 3g dietary fiber, 366mg sodium.